The Taoiseach said there will be a fresh push to get the Northern Ireland Executive up and running in the new year. 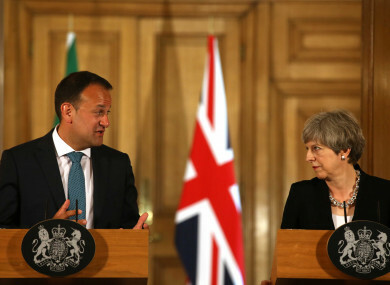 TAOISEACH LEO VARADKAR has said the relations between the Irish and British government have been strained over the Brexit negotiations – but pointed out that everyone needs to be “grown up” about it. Varadkar has previously pledged to rebuild trust between the two governments, stating that while relations may have been damaged, it is fixable. However, he was quick to point out that whatever strain there has been, it is due to the British decision to leave the European Union. Brexit was not our policy. Brexit was a decision of the UK people which we respect and is being pursued by the government in the UK. What has strained relations is that decision. But we need to be grown up about it. Varadkar said all parties need to “get on with it” and progress with the talks, which are expected to be particularly tough as they enter into phase two. He said his main priority is getting the best outcome for the Irish people. “So even though relations are strained because of the different positions we’ve taken, they’re not bad,” he said, adding that he speaks to UK Prime Minister May probably every two weeks. “I don’t think things are mutually exclusive. In a lot of areas we’d be very similar. For example on free trade – both of us will want to have as close as possible a relationship when it comes to trade for example, so you know, I think there’s a lot of work we could do together there. Looking ahead to 2018, the Taoiseach said there will be a fresh push from the Irish government to get the National Executive in Northern Ireland up and running. “I am very conscious that there are a number of parties in Northern Ireland, all of which represent people there. And I’m certain the Tanaiste and I will be meeting them over the course of January and doing anything we can do to get those institutions up and running again,” he said. It has been nearly a year and the talks have failed to deliver a solution to governing the North. Talks have progressed, and broken down, with deadlines being extended and then broken. If talks in the new year fail to re-establish the institutions in the North, the Taoiseach said there are two options open to them. “There first option is another set of elections, which is an option, although it’s hard to see what outcome would raise from that would put us in a better position. The second option is convening the British-Irish governmental conference, which would allow the two governments to implement the Good Friday Agreement in the absence of an assembly and executive in Northern Ireland,” he explained. “The Good Friday Agreement provides for matters that are not devolved to be dealt with by the British-Irish governmental conference and that’s what we will seek,” added Varadkar. While he said the term “joint rule” is not used in the Good Friday Agreement, he said it does speak of a British Irish governmental conference, “which is not joint rule because obviously the legislative powers remain at Westminster, but it does involve real and meaningful involvement of the Irish Government,” he explained. We won’t be supporting direct rule. We didn’t support direct rule. So the alternative to the assembly and the executive being up and running is either a) an election or b) convening the British-Irish government conference and that’s what we’ll seek and I should point out that is what the Good Friday Agreement says. So all we’d be seeking is the implementation of the Good Friday Agreement which as you know is an international agreement between two governments endorsed by referendum in both parts of the island. Email “'We need to be grown up about it': Leo says Irish-British relations are strained”. Feedback on “'We need to be grown up about it': Leo says Irish-British relations are strained”.